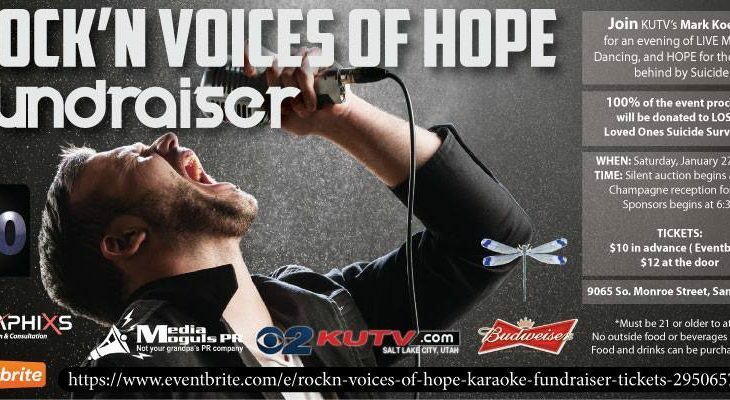 Join KUTV’s Mark Koelbel for an evening of Live Music, Karaoke, Dancing, and Hope for those left behind by suicide. Live Music from Natural Causes! Karaoke! Silent Auction! Food, Drinks and Dancing! Contact Blair Nicole (Blair@Blair-Nicole.com, 801-664-6061) for additional information, to donate in-kind items for our silent auction, or to inquire about sponsoring the event.